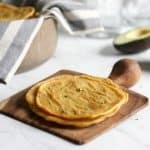 These Plantain Tortillas have only 4 ingredients and are quick and easy to make – no rolling out or flipping on a skillet! They are pliable and puffy, and while they taste amazing, they’re also AIP, Paleo, Whole 30, and gluten free! 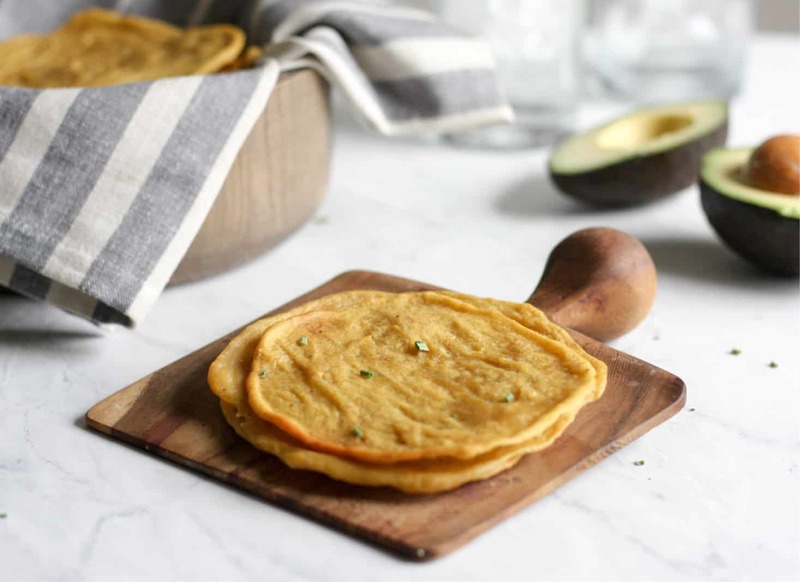 I followed my first autoimmune protocol (AIP) back in October of 2014, and this recipe for Plantain Tortillas was the first AIP compliant recipe I perfected. Fast forward to present day (April 2018) when I realized I never shared it! Obviously I had to remedy that near-fatal error, as these Plantain Tortillas are money. I prefer to make these with green plantains, since the plantain is a great resistant starch and prebiotic source when it’s not quite ripe. 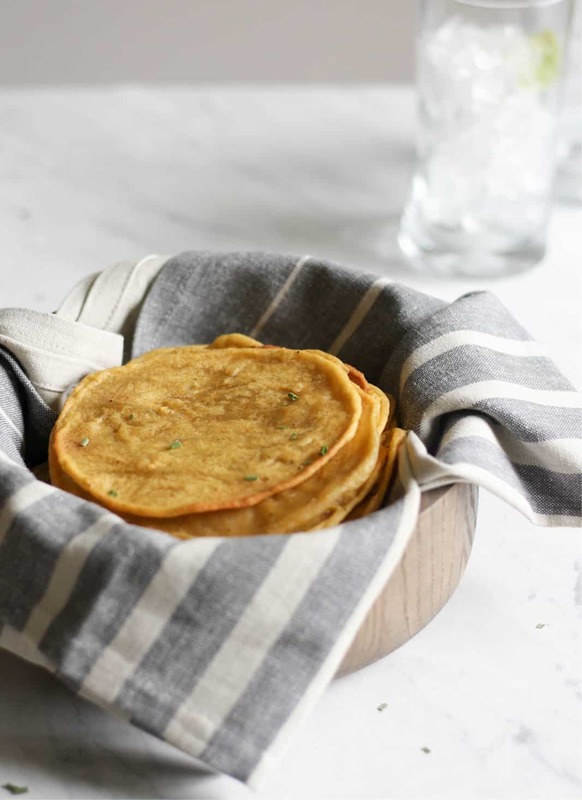 However, you can make these plantain tortillas with yellow plantains, or even brown spotted ones. The color and flavor of the finished product will vary depending on the ripeness of the plantain. A rule of thumb is that the green plantains will be less sweet and a bit lighter in color, while a yellow or brown plantain will be more sweet and deeper in color. Avocado oil is a wonderful oil to use in this recipe, as it is very neutral in flavor. The olive oil still works well, but does have a stronger flavor. Why do I offer olive oil as an option at all? One thing to keep in mind about avocado oil is that it is a refined oil. Refined oils are typically purified using harmful chemicals, so it isn’t a good idea to purchase just any bottle you find. There are a select few brands of avocado oil that I trust, as they use a cold press technique to extract the oil without using any chemical solvents. My favorite bran of avocado oil is Primal Kitchen. I add pink Himalayan sea salt liberally to all my meals and dishes, and this one is no different. While it seasons the dish with a bit of flavor, it also provides over 80 trace minerals including calcium, magnesium, and iron. I use this brand. 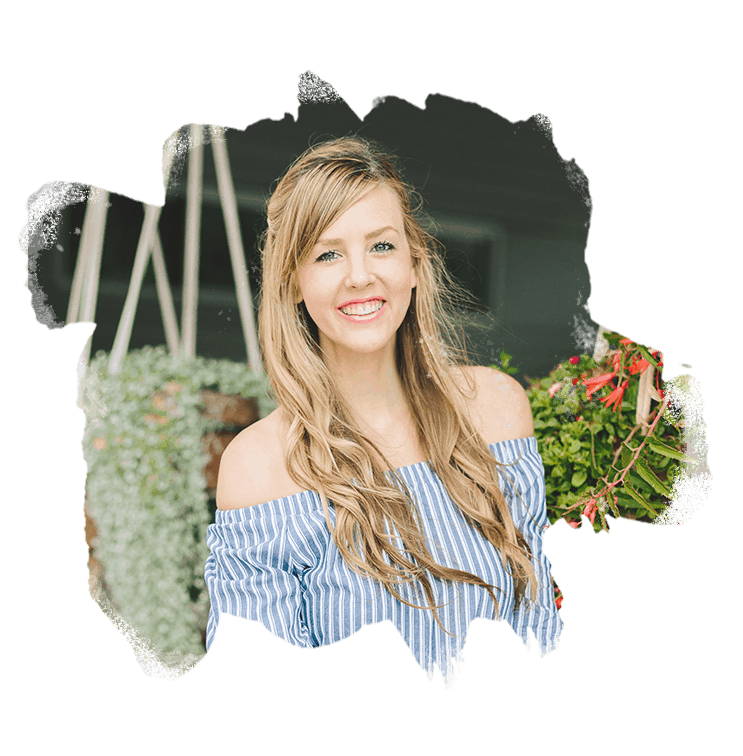 While it may seem silly to even explain water, I wanted to bring up the importance of using appropriately filtered water. Unfortunately, the city water supply in most every US city is unclean at its best, and detrimental to our health at its worst. My family uses the Big Berkey water filter, which is just about the only free-standing water filter I recommend. With this filter you can take water from any outside source and create completely purified drinking water. It’s a bit of an investment, but I highly recommend saving up for one. I have several recipes forthcoming that feature these puffy tortillas, like AIP and dairy free Lox and Cream Cheese pinwheels and Chicken Salad wraps. In the meantime, you can enjoy them as I often do – with nightshade-free tacos. Saute your choice of protein (fish, steak, and chicken are great options) with caramelized onions and top with a crisp cabbage salad and my dairy free Cheese Dip. … and now all I can think about are fish tacos. Yum! Let me know in the comments what you paired with these tortillas! 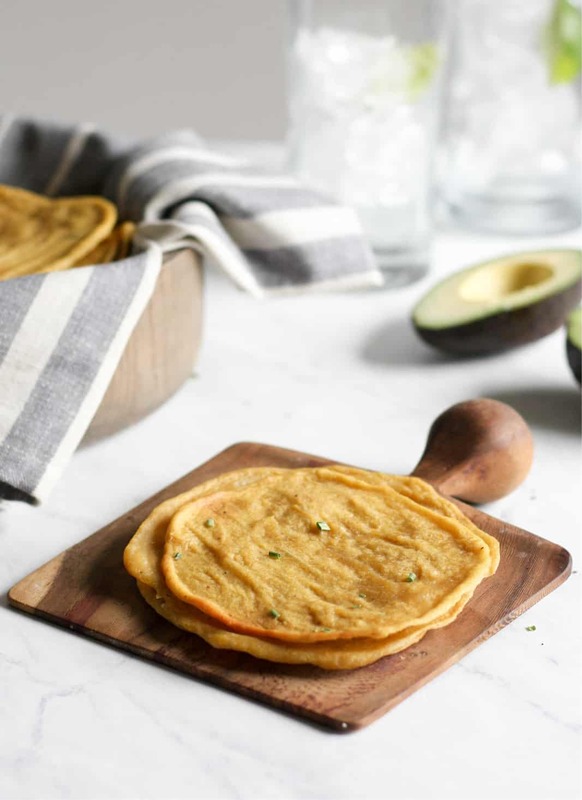 These Plantain Tortillas have only 4 ingredients and are quick and easy to make – no rolling or flipping on a skillet! They are pliable and puffy, and while they taste amazing, they’re also AIP, Paleo, Whole 30, and gluten free! Preheat oven to 400°. Place a sheet of unbleached parchment paper on a baking sheet. Peel and chop plantains and place in the carafe of a high powered blender along with the oil and sea salt (I used a Blendtec). Blend on high, stopping to scrap the sides down with a rubber spatula. Depending on the exact size of plantains you use, you may need to add water in order to get the batter to be a creamy consistency. Add water to your blender carafe as needed, 1 tablespoon at a time. The end consistency should be very thick, but completely smooth. 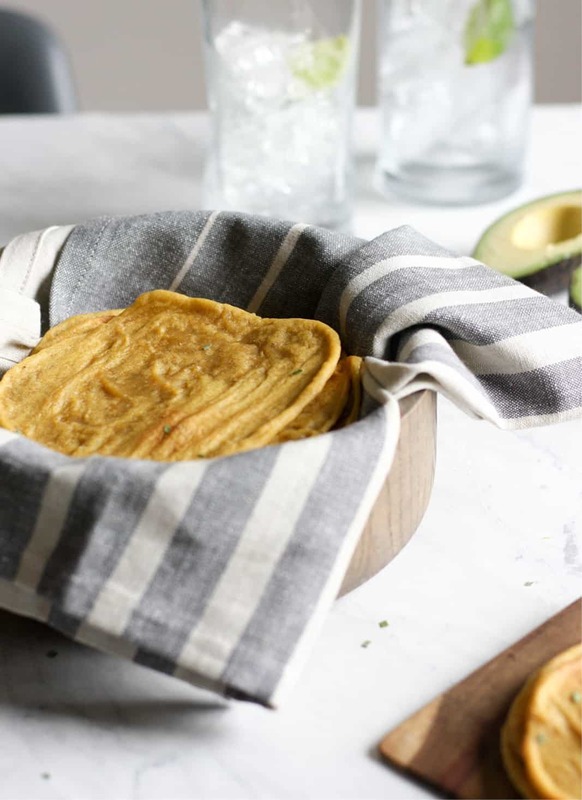 Use a spoon or spatula to spread the batter into 16 individual tortillas on the parchment paper. You may need more than one baking sheet depending on the size. Mine were about 1/4″ thick and about 6-ish inches. Bake for 15 minutes, remove from oven and flip, then bake another 5-10 minutes. Store in a sealed container in the fridge for 2-3 days, or freeze between sheets of parchment paper for several weeks. The plantain tortillas will be most pilable fresh out of the oven. I prefer to use avocado oil for it’s neutral flavor, but olive oil works as well. These were fantastic! After I whipped up my batter, I realized I was out of parchment paper. I oiled my baking sheet and hoped for the best! Without paper to absorb oil, plus extra oil on the sheet, mine came out crispy! I wrapped up some turkey with them, tasted like a monte crisco!!! Love it! Thank you for sharing this, I really appreciate it. We love taco nights in our house and have been missing tortillas since making the AIP shift. These are great and have revived taco nights for my family. My husband was cautious, but threw his whole wheat tortillas aside for these! My toddler is obsessed with them! We’ve done ground meat, fajita style chicken, and shrimp tacos on these–all winners! Thanks!